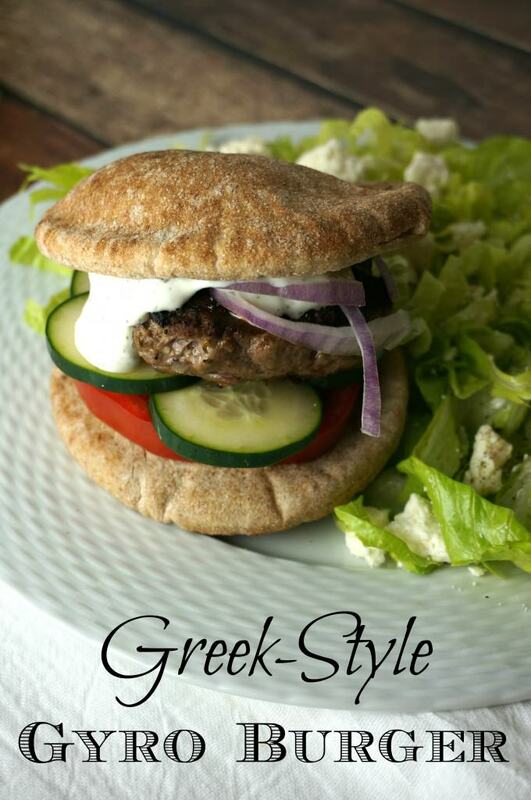 These gyro burgers are a household favorite. 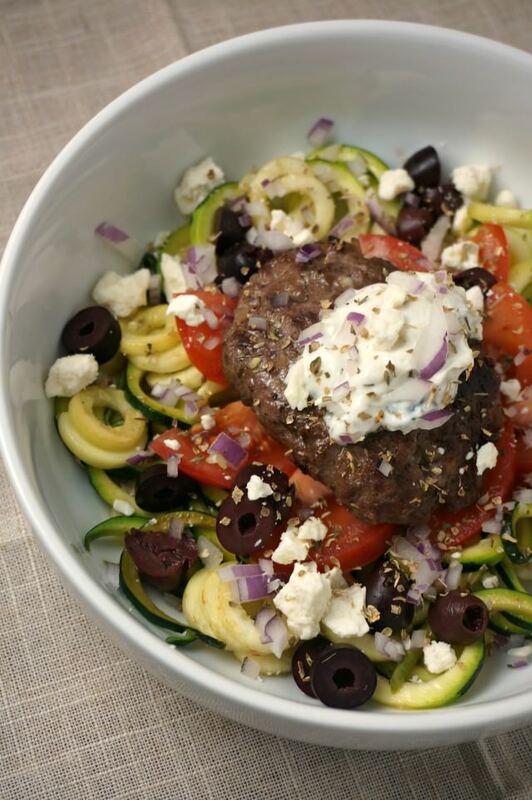 They can be dressed up with Greek favorites like feta and kalamata olives, but they pack such a punch of zesty flavor on their own, that you can eat them any way you please, including completely on their own! The ingredient list is simple but produces a surprisingly flavor-packed burger. These burgers are so simple to make ahead. You can prep the during the day or even the night before! The flavor in these burgers is UNREAL. Wash your hands and get in there. 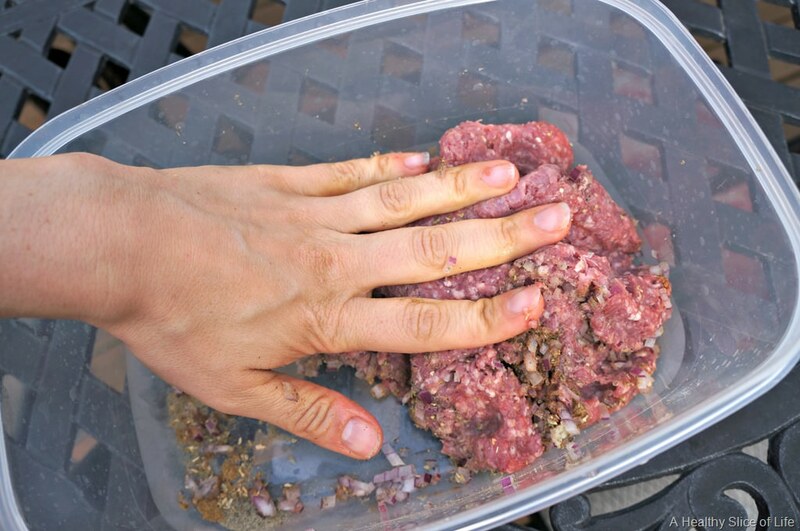 You want it thoroughly mixed without overworking the meat. Divide into 4 long patties. Pan fry them over medium heat with cooking spray or a little olive oil for about 3-4 minutes per side, until cooked through. Of course you can use Tzatziki, but this dip was incredible. These totally hit the spot and we devoured them in no time. I’m sure you could use ground beef or maybe even ground turkey, but the lamb makes them taste truly authentic. Eat them on a pita or n a bed of zoodles; either way is sure to be delicious! 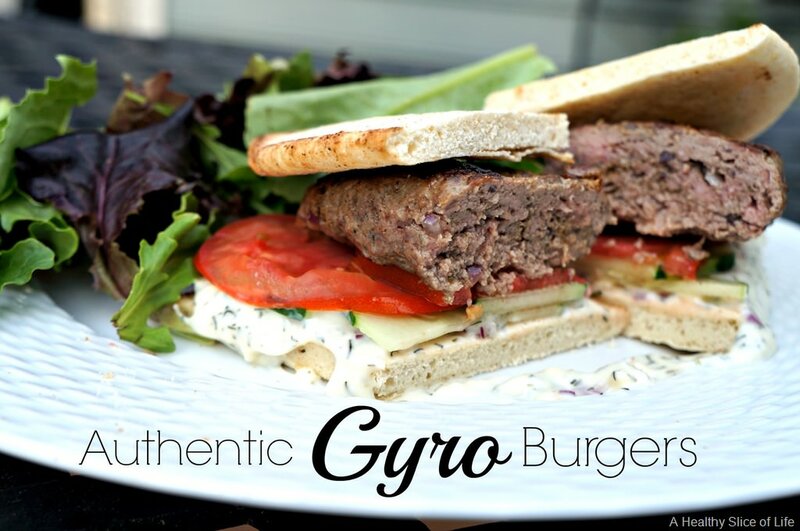 The flavor bursting out of these gyro lamb burgers is so incredible that toppings aren’t even necessary. Absolutely delicious! Add all ingredients to a large bowl. Using your hands, mix until well-combined, being careful not to overwork the meat. 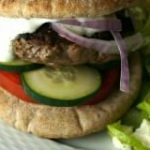 Form into 4 patties that fit the size of the pita bread you are using. Pan fry over medium heat, about 5 minutes per side, until cooked through. 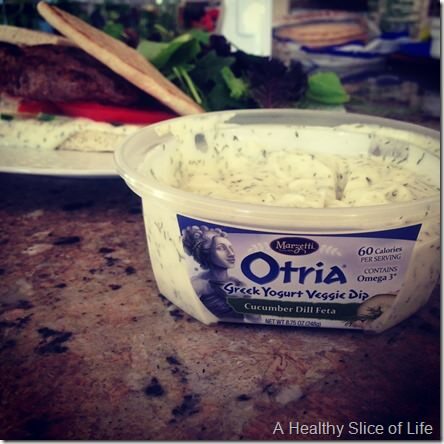 Serve on pita bread with cucumbers slices, tomato and tzatziki. 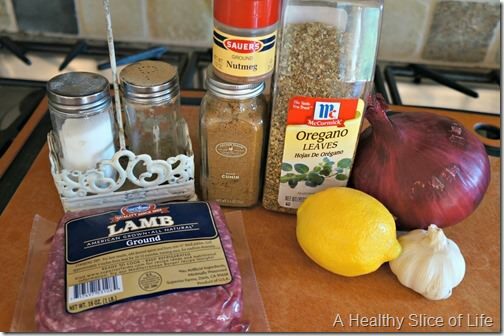 Do you ever use more exotic meats, like lamb or bison, at home? We love bison, its expensive and hard to find but for a treat once in awhile, why not, right? I cant wait to give this burger recipe a try. I am absolutely LOVING the concept of those burgers. I will have to attempt a vegetarian version! Oh if you do, please share it! I make those exact burgers all the time. We love gyro burgers. I usually make my yogurt dip but now I realize they sell a similar dip to what you had at Trader Joe’s. Just cut my prep time down. I also bought the quinoa noodles since you had mentioned them but have yet to use them. Looking for a good recipe. Did you know they also sell that same brand of macaroni and cheese? I have yet to try it with my daughter but I definitely bought it!! A $4 box of mac and cheese. Yikes! I love these meal planning posts! I’ve adopted your Sunday ritual of meal planning, shopping, and prepping and it eases my stress level, too. Please keep these coming – they inspire me! Thanks so much for the feedback! It’s nice to hear they are helpful. Hooray for food prep! We love occasionally treating ourselves to bison burgers or lamb burgers as well! My husband likes to try anything and everything, so he’s also grilled up frog legs and is always on the look out for deals on exotic meats to try. oh frog! Crazy brave 🙂 I love adventurous eaters, though. Makes meals fun! My favorite burger isn’t all that exotic due to the meat. It’s due to the nostalgia. The Wife was able to somehow create this that’s based on my favorite homemade hometown garlic salad dressing. I had lamb meatballs last night and they were fantastic. This makes me want mooooore!! Do these really taste like Gyros? I love Gyros with real ground lamb but can’t stand the taste of lamb chops. I would hate to spend the money on ground lamb and then have it taste “gamey” like lamb chops. They look really good though! Not gamey at all! To be honest, I can’t remember the last time I had a real gyro (still begging to visit Greece one day ;)), but these are freaking great. I mean it. I’m a little weird about venison, quail and such, but these are pure deliciousness. Please try them and let me know what you think! I’m obsessed with The Meat House, too! Have you tried their chicken marinated in their own Meat House seasonings? We are a bit obsessed with it right now- so juicy and delicious. I totally agree with you about the meal planning thing. Having a plan makes me feel way less stressed than just winging it. I’ve never experimented much with lamb, but these burgers sure do sound amazing! These look delicious! I <3 lamb. You can meal plan for us any day! especially with those lamb burgers! lamb is a favorite here. Also, I meal planned this week. And by meal plan, I mean I chopped up a watermelon and bought some pre-made TJ’s salads for my lunch. Baby steps. Lamb is big here in South Africa. It’s expensive as well but we do enjoy it on the BBQ and in the oven. Love your meal plans for the week. …so maybe this would be a little much for you… But I’d love the recipes/grocery list for all of this so I could follow it the next week. Sounds delicious. All of it! Maybe a new post if not too much?? Exotic meats are too expensive. I love the look of your burger here. I just made these burgers last night for dinner and it’s crazy how flavorful they were! I served them without the bread over spinach, tomato, red onion, avocado and a homemade tzatziki. Even my oldest kids (2 & 3.5) gobbled them up. Thanks for the recipe! 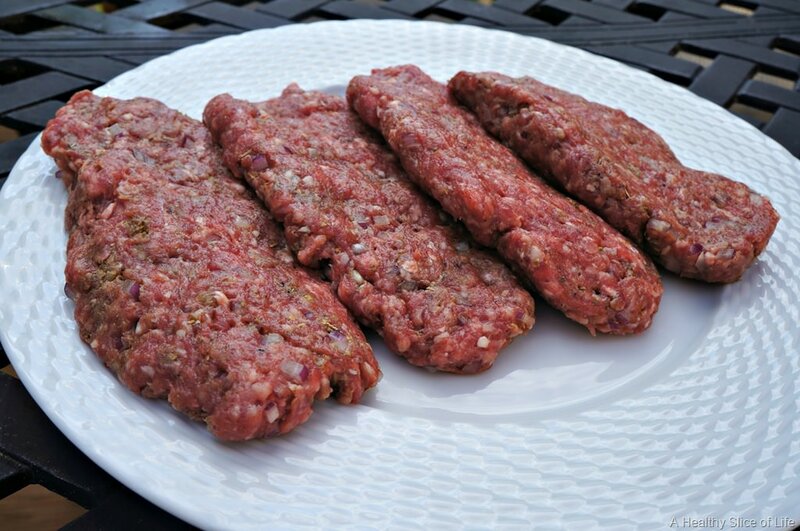 These lamb burgers are the best!!! They are an absolute favorite and one of our go-to weeknight dinners. Do you know if there are any health benefits for selecting lamb over beef? Not any benefits that are outstanding. For these burgers, I prefer the taste of lamb more, and if you are buying conventional versus natural/organic, then lamb can be a bit more humane/healthier because it is not mass produced. However, comparing apples to apples, I don’t believe there is much difference. So glad you enjoy these burgers as much as I do! Just had this for dinner on zoodles and it was so yummy! Thanks for the recipe!! Awesome! Made this tonight with ground chicken and ate it over zoodles seasoned with olive oil, fresh lemon, dill, and garlic salt. SO GOOD! Awesome! I”m so glad you loved them as much as I do. Thank you for the feedback!